A native of Brazil, Professor Schwingel has spent the last 10 years studying relationships among culture, aging, and health. She received her Ph.D. in sports medicine from the University of Tsukuba in Japan, after completing a bachelor's degree in physical education and a master's degree in engineering, both from the Universidade Federal de Santa Catarina in Brazil. During her doctoral studies, she served an internship in the Aging and Life Course Program of the World Health Organization in Geneva, Switzerland. She also completed a post-doctoral position as a research coordinator at the National University of Singapore. Her dissertation research compared the risk of developing cardiovascular disease in three groups of adults and older adults of Japanese ancestry. In most developed nations, cardiovascular disease is the leading cause of death. In Japan, however, it appears second on the list. Professor Schwingel points out that Asians in general have greater levels of genetic protection against heart disease, including having higher levels of HDL, or "good" cholesterol. In her study, she found that people of Japanese descent who had lived abroad and experienced lifestyles other than Japanese had a higher risk for developing cardiovascular disease, including having lower levels of HDL cholesterol. At the National University of Singapore, Professor Schwingel coordinated a multi-country research project that examined the impact of transnational migration on a wide variety of health and quality of life outcomes. The main goal of the project was to understand the possible impact of absent parents on children's development and mental health throughout Asia. Many countries in Southeast Asia, including Vietnam, Thailand, the Philippines, and Indonesia, face economic challenges. As a result, many families send their economically active family to work in wealthier nations, such as Singapore and Japan. The aging of the population in most developed countries has increased the need for both in-home and hospital caregivers, roles traditionally filled by women. Consequently, many children in poorer Asian countries are growing up without their mothers and/or fathers. "On the one hand, one might think it's great that parents are able to send money home so that their children can go to school, access health care, buy food, and so on," Professor Schwingel said. However, she emphasizes that the loss of one or both parents to immigration can have profound, adverse individual and societal costs. In her work with the Aging and Diversity Lab, which she co-directs, she will continue to examine cultural and social impacts on immigrant health, with a focus on Latino/as. Professor Schwingel's research will examine how traditional health promotion messages and campaigns need to be modified in order to acknowledge the cultural complexity of this population. 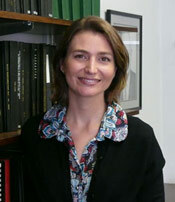 In addition, she will teach a variety of undergraduate and graduate courses in the community health program.